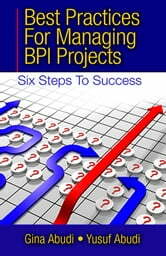 While there are numerous project management books on the market and a number on business processes and initiatives, there has been a lack of comprehensive guides to successfully manage business process improvement (BPI) projects, until now.BPI projects are some of the most difficult and challenging to manage. Improving results for the business is not an easy task! Doing so requires understanding the vision and long-term goals of an organization. It also requires the ability to engage stakeholders and manage change. Best Practices for Managing BPI Projects is a guide for project managers who want to improve how they manage BPI projects. Using a simple step-by-step, six-phase approach, project managers and others involved in BPI initiatives will increase their confidence and their effectiveness in managing the complexities of business process improvement projects. Special focus is given to the necessary leadership skills required to be successful in driving change by improving processes within an organization to improve business results.